fuels and lubricants, materials (including plastics and elastomers), tires, off-highway and construction vehicles, testing, and electronics. Co-published by SAE and Butterworth-Heinemann. 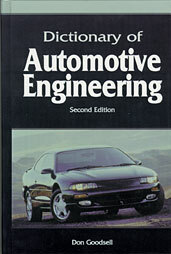 If you do not have access to SAE MOBILUS via username/password or institutional access, you can still purchase the Book, Dictionary of Automotive Engineering-Second Edition.